Growing up I wanted to be Indiana Jones. I wanted to see some adventure. Long before my awareness of the almost innumerable issues that plagued the series, I thought melting Nazi faces off with ancient artifacts while wearing a cool hat and neglecting professional responsibilities in service to the preservation of history (it belongs in a museum!) sounded rather great (can we pause to recognize how terrible it must have been to be Prof. Jones’ graduate assistant?). With those childhood dreams in the rearview (mostly in the rearview, that is), my adventure usually leads me to a dusty library archive where my only hopes to melt Nazi faces comes during my lunch break when I might encounter a Nazi on Twitter. In a recent adventure to the Bancroft Library at UC-Berkeley, I was in search of the “holy grail” archival find that might take my current research project to the next level. Combing through files on former Black Panther Party Minister of Information, Eldridge Cleaver, I stumbled upon an article that caught my eye. While not the “holy grail” I was looking for, the find serves as an example of what one might stumble upon in the archives and more importantly, how acts of classification have real life, tangible consequences. 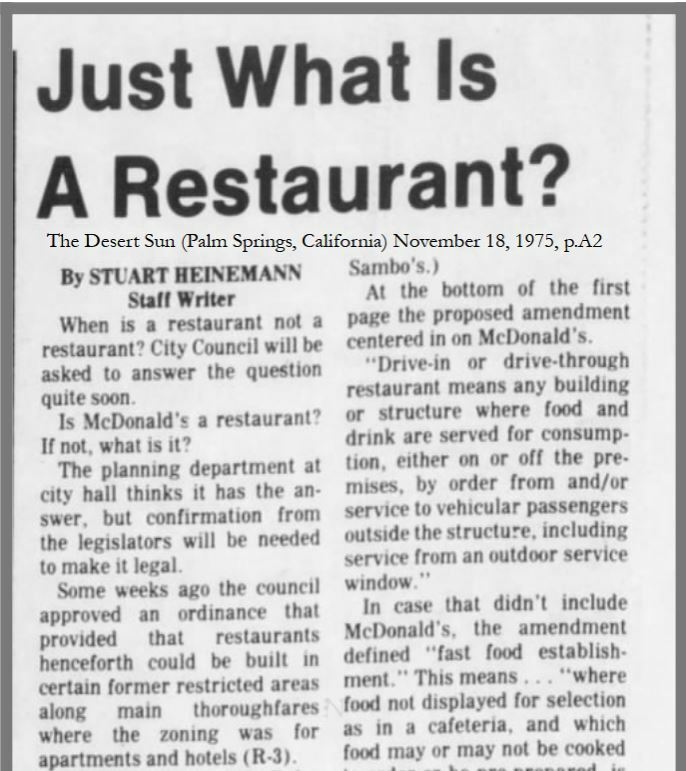 In the Tuesday, November 18, 1975 edition of Palm Springs, California’s The Desert Sun newspaper, staff writer Stuart Heinemann asked, “Just What Is A Restaurant?” (find the PDF here). Heineman wanted to know when a restaurant was not a restaurant. 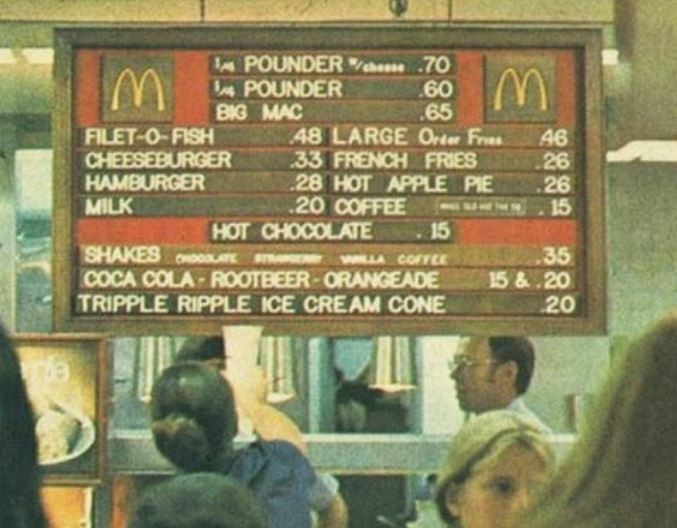 Specifically, he wanted to know, “Is McDonald’s a restaurant? If not, what is it?” Such questions were presented in light of a recent Palm Springs city council meeting that rejected the construction of a McDonald’s franchise in an area they hoped would establish East Palm Canyon Drive as a “gourmet capital.” For the city council, McDonald’s wasn’t the type of restaurant permitted in the city code. Indeed, a fine example of how classification is a political act. As Heinemann wanted to know then, what was a restaurant then? Heinemann reported, “It took two pages of legal phraseology to write the hamburger haven and others of its kind out of contention.” City ordinance, which provided restaurants the opportunity to be built in formerly restricted zones, clarified that “cafeterias, drive-in or drive-through restaurants, or fast food serve establishments” were not considered the type of “restaurant” the Palm Springs city council had in mind when amending the city code. In fact, city planners would not settle for anything less than a “Bob’s Big Boy,” the real definition of a restaurant. Local reports like Heinemann’s, while not the “holy grail” archival find I was looking for, are rich examples of how acts of classification have measurable impact. Most interestingly for me, the happenings of the Palm Springs city council were situated next to an article entitled, “Cleaver Faces Certain Arrest.” In 1968, the Black Panther Party Minister of Information Eldridge Cleaver fled the United States after a shootout with Oakland police. After a seven-year exile, Cleaver returned to face his charges in court. While Stuart Heinemann was writing about local classification of Palm Springs restaurants, Cleaver’s return to the United States signaled the beginning of a public discussion on how to classify Cleaver’s religious and political identity, which haunted Cleaver until his death in 1998. In 1975 while on the balcony of his Paris apartment, Eldridge Cleaver had a vision. In the vision, he saw Karl Marx, Friedrich Engels, Mao Zedong, Fidel Castro, and Jesus Christ. According to Cleaver, Jesus told him to surrender to the gospel of Jesus and the American authorities. By 1976 Cleaver claimed that he was a “born again” Christian and toured the country with the support of Billy Graham, Chuck Colson, Pat Robertson, and Jerry Falwell. Evangelicals heralded him as the Marxist Black Panther turned Bible-believing conservative. After the novelty of Cleaver’s conversion wore off for evangelicals, however, Cleaver became a follower of Sun Myung Moon, sampled Baptist and Catholic churches, converted to Mormonism, and founded the religion he called “Christlam.” In the midst of his religious exploration, the evangelicals that rallied around him in 1976 questioned the legitimacy of Cleaver’s belief and wondered if he was truly “authentic” or just an opportunist. When Cleaver fell on hard times later in life, the evangelical supporters were nowhere to be found. As I work to understand the importance of Cleaver and his impact on understandings of religion as a category, maybe Heinemann and a random article in The Desert Sun is asking the right questions. How are the terms we use constructed? Who gets to define them? Just what is a restaurant? Maybe there is a little bit of adventure to sorting through old papers in an archive. Which brings me to my last question, just what is an adventure? This entry was posted in Faculty Blog, Guests, Relevance of Humanities, Religion in Culture and tagged archives, Classification, Definition, Indiana Jones, Restaurants by admin. Bookmark the permalink.